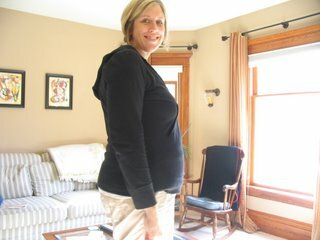 A Life Unfolding: 16 Weeks! Okay, although I am not so fond of the pictures of myself staring at the camera, it really is much more fun to have a visual! So, here we are, me and bean, at 16 weeks and 4 days! I just got home from the doctor, it was a good visit. I got to hear the heartbeat beating strong. It was so different from the last visit 4 weeks ago. At that visit it felt like it took her forever to find the heartbeat and then once she did we only got to hear it for a short time before she lost it. This time, the minute she put the little doppler thing on my stomach we heard it beating strong. It was awesome. She said that it sounds perfect. She showed me on my stomach right where the baby is and that was cool too. Other than that, not too much exciting happened. I got to schedule our ultrasound, that will be in three weeks. We can't wait for that! Outside of that she said that everything looks great! We can't believe that we are over 4 months along already, time just flies!! !